Servant leadership is a powerful model that has guided how I lead for years. I learned about it in the Army, observing others in action. I believe this world would be a better place if more people adopted this approach in their profession and in life. 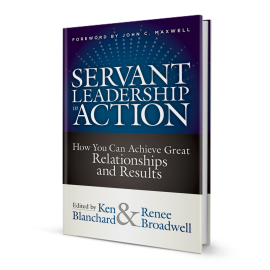 I’ve been asked by the best-selling author Ken Blanchard to contribute to Servant Leadership in Action, a book of essays by 37 servant leadership experts and practitioners. The book will be available in early 2018. What follows is a part of my contribution to that work. 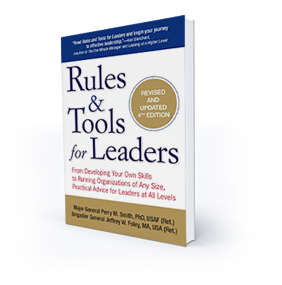 I invite you to read and consider how my experiences in servant leadership might help you in your leadership journey. In the words of General Creighton Abrams, former US Army Chief of Staff: “Soldiers are not in the army. Soldiers are the army.” This is a powerful reminder of the fact that our army is made up of people. Soldiers are people who need to be trained, equipped, cared for and well led. Sergeants are the leaders of the enlisted branch of the army. The origin of the term sergeant is from the Latin serviens, which means one who serves. So at the very core of the army, the focus is on sergeants as ones who serve. For many folks not in the profession of arms, there is a common misperception that the army operates in a strict hierarchical structured environment. Non-army personnel believe that command and control is exercised daily by those with the highest rank. There is some truth to that—especially during times of crisis when quick decisions need to be made. However, for the majority of time when lives are not on the line, nothing could be further from the truth. In the army, true leadership is not about being a master—it’s about being a servant. It is about meeting the needs of people. In the mid 1990s, the Army embraced seven values: loyalty, duty, respect, selfless service, honor, integrity, and personal courage. These values define expectations of behavior and are well defined, trained and reinforced routinely throughout military life. The oath, values, and creed are not just words. They drive home the commitment to serve fellow soldiers and our nation, both greater causes than ourselves. They provide the foundation for the army’s culture. To volunteer to willingly give up one’s life for a greater cause is perhaps the most profound example of servant leadership. In 1978 I landed at Fort Bragg, North Carolina, on my initial assignment out of West Point. On day one I was met by the senior enlisted soldier of the battalion, Command Sergeant Major Tad Gaweda—a tough, battle-hardened veteran soldier and marvelous leader. He said to me that day: “Every soldier has a sergeant. Don’t ever forget that.” The keen insights I learned from listening to sergeants paid huge dividends for the next 32 years, and continues today. The need to listen is not limited to sergeants, of course. You cannot help anyone if you do not listen with the intent of understanding. This skill demands tireless practice. When I was able to set aside my ego, I learned tons from squinting with my ears. The Army does not have professional privates or lieutenants. Soldiers either get promoted or leave—it is either up or out. Those who demonstrate leadership potential earn the opportunity to continue to serve. The biggest differentiator between the Army of the United States and all others is the monumental investment in the training and leadership development of our professional non-commissioned officer (NCO) corps—our sergeants. We call our NCOs the backbone of our army because of the monumental role they perform in leading, training, caring for, and motivating soldiers. The development of officers is equally important. The Army develops soldiers in three ways. First, soldiers attend formal training and educations programs as they get promoted. Second, soldiers learn through on-the-job experience through leader development programs at the unit level, coaching and mentoring. Third, soldiers learn through self-development. In the corporate world this combination of actions is referred to succession planning. In the army, succession planning is everyone’s job, every day. Servant leaders inspire people to grow while discovering their skills and unique gifts. They do all they can to facilitate that growth by putting them in positions where they can flourish. One of the key roles of a servant leader is to be visionary, which means to communicate with precision about what is expected in the future. In the Army’s standard mission orders process, there is a specific place for what is called commander’s intent. The concept describes what constitutes success for the operation and links the purpose to how the operation is envisioned to go down. When done well, this intent facilitates a shared understanding of what is in the mind of the commander. I remember writing these valuable intent statements. Once clear understanding is achieved, the higher level commander then becomes the servant by doing everything possible to enable the success of the subordinate commanders to meet that intent. This is a bit oversimplified but it illustrates servant leadership in action. This same process is used at all levels of the Army including (less formally) down to sergeants leading small teams. True leadership comes to life when mutual trust exists between leaders and followers. Genuine trust happens when soldiers train, sweat, bleed, and sacrifice together in preparation for the ultimate test of combat. Trust is enabled when troops are honest with each other and hold each other accountable. There is an element of love and support that develops as soldiers of all ranks live life together. This unique esprit-de-corps is the special sauce that really separates great teams from good teams. When there is a lack of trust in a military unit, the consequences are significant, possibly catastrophic: decisions are questioned, commitment evaporates, discipline erodes, and the unit becomes ineffective. It does not take long to create an environment of distrust. When soldiers know their leaders have their backs, they trust them and will do anything for them. Nowhere it is more critical to demonstrate the care for soldiers then when tragedy strikes. I learned when something tragic happens to a soldier, go to them and the home of their family. Do not worry about what to say; the family just needs to know that you care. I visited many homes. I wrapped my arms around a lot of troops and families in need. In the best units I served, I felt the love and support of those around me. I knew they would come to my aid if needed, just as I would them. The best leaders I served with built trust among their soldiers. These five lessons are what I learned about how servant leadership contributes to winning cultures for the US Army, an organization people want to join and remain. Those who serve are volunteers and do so in support of a grateful nation. When the American people show their gratitude, it makes a difference because the soldiers know the people care. To summarize how soldiers and their comrades in other services feel about serving in uniform, allow me to highlight a profound day in our recent military history. The date was July 4, 2008. The location was Camp Victory, the United States military headquarters in Baghdad, Iraq. On that day 1,215 soldiers, sailors, airmen, and marines raised their right hand and pledged to continue defending the land of the free in the largest reenlistment ceremony since the all-volunteer military was established in July 1973. Why did so many troops choose to remain in uniform and to do so in the combat theater where so many had deployed and been sacrificed over seven years of conflict in Afghanistan and Iraq? I believe the servant leadership environment created by soldiers of all ranks was a principal contributor. I also learned when you sacrifice and suffer in defense of America, you learn to love it more.